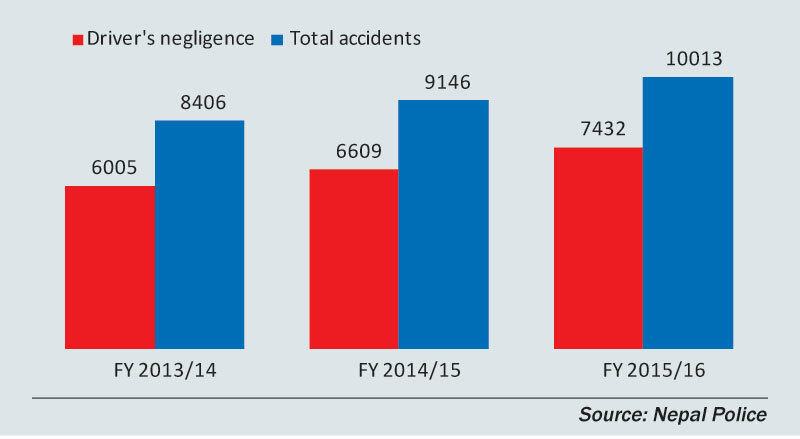 KATHMANDU, Aug 27: Road accidents are primarily a man-made crisis, with human error especially drivers' negligence accounting for over 80 percent of accidents, according to spokesperson for Nepal Police, DIG Madhav Prasad Joshi. “Most of the road accidents are caused by human error,” he said, adding that major accidents could have been averted if the drivers had paid more attention to the safety aspects. The situation is out of drivers' control only during unpredictable cases like natural disasters and other sudden technical failures, according to the police spokesperson. Drivers are not the only ones responsible for road accidents as vehicle entrepreneurs also should take their share of blame. Entrepreneurs should regularly check for updates regarding the condition of their vehicles. “In order to avert accidents, drivers should strictly follow basic traffic rules including obeying traffic rules and signals, control over speeding, give proper attention while overtaking and not to drive under the influence of alcohol or drugs,” he added. “Blaming the road condition is always a lame excuse. Drivers can avert accidents by slowing down the speed in wet roads and by not tailgating others,” said DIG Joshi. People point their finger to the police after major accidents. But it should not be forgotten that multiple sectors including the department of roads, transport entrepreneurs, passengers and police are equally responsible to minimize the frequency of accidents. More attention should be given by all stakeholders to road safety as festive season is approaching, according to DIG Joshi. Generally, transport syndicates openly flout the traffic rules during festive seasons causing more accidents. The festive season sees the problem of overload and flow of unmaintained vehicles more frequently than at other times, according to former secretary at the Ministry of Physical Infrastructure and Transport, Tulasi Prasad Sitaula. Police vigilance is a must to control possible accidents whether it is festive season or not, Sitaula said, adding that political parties should also stop supporting transport syndicates. He further stressed on the need to introduce commercial licensing provision to make drivers more responsible. The provision has included some stringent provisions that drivers should follow before taking licence to drive public vehicles. “Consecutive governments have been unable to introduce the provision due to pressure from syndicates of transport entrepreneurs. It is high time that the policymakers should show courage to save lives from road accidents,” he said. Leaders express concern about road accidents, but do they mean it?